Friday, July 13th! Meets at 7pm at 703 Pacific Ave. Meets at 703 Pacific Ave.
Left turn on Pacific Ave.
Loop through downtown, eventually heading east on Soquel ave.
Head towards west cliff out of traffic circle. Make our way back towards Cycle Works (1420 Mission St) for BBQ and afterparty!!!! B boys and B girls! Midnight marauders! Remember hip hop in the 90’s? Some call it the golden era – before commercialism took over, before auto tune, when hip hop was more about having a good time, lyricism, and telling compelling stories? Remember the Fugees, Tribe, Arrested Development, Public Enemy, TLC, Queen Latifah, 2Pac & Biggie? The list goes on and on, and in retrospect, it is pretty amazing how many different flavors of hip hop got radio play. 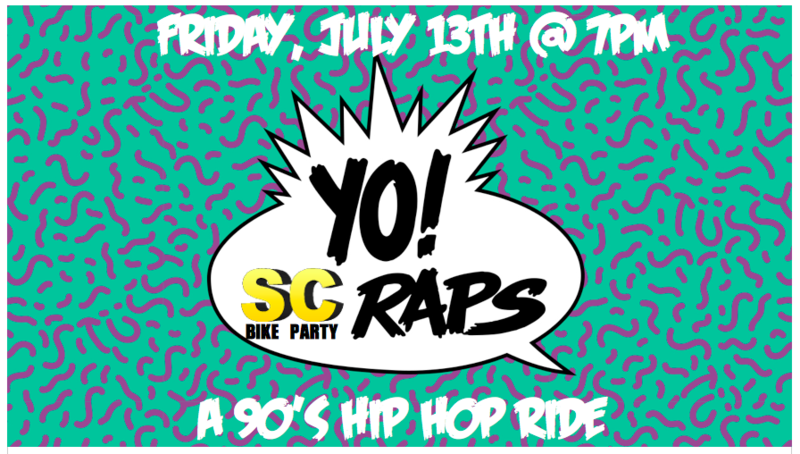 So… Let’s take a trip down memory lane, ride wit us, bump some old school tracks, explore hip hop’s 4 elements, and celebrate the amazing (and sometimes awkward) hip hop fashion of the 90’s. We’ll cruise through the cruz, and celebrate summer summer summertime!